Congresswoman Rosa DeLauro speaking at IWPR’s 25th anniversary event. 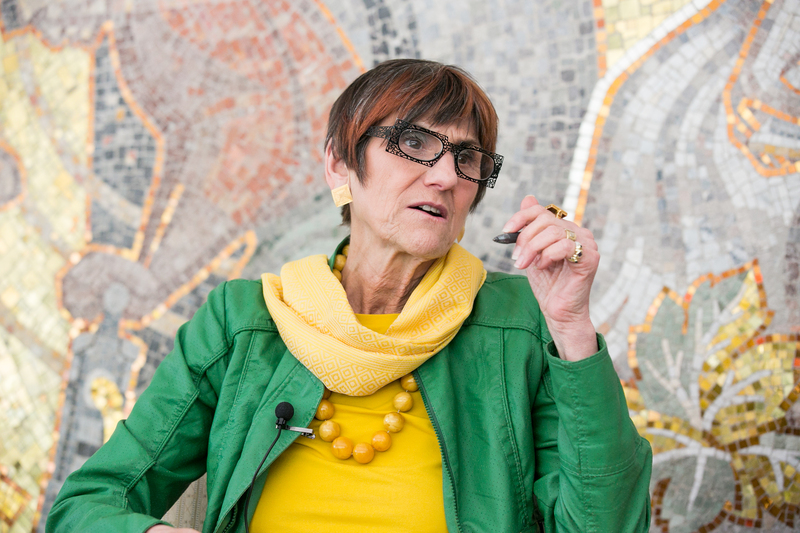 Congresswoman Rosa DeLauro is known in Washington, D.C., is a champion for women. Her dedication and continued work to improve policies for women and their families demonstrate why more women should run for office. Rep. DeLauro represents Connecticut’s Third District, which stretches from the Long Island Sound and New Haven to the Naugatuck Valley and Waterbury. She serves in the Democratic leadership as co-chair of the Steering and Policy Committee, and she is the ranking member on the Labor, Health, Human Services, and Education Appropriations Subcommittee. From that position, Rep. DeLauro works to increase support for education and innovation, to fully implement the Affordable Care Act, to protect the rights of employees and unions, and to raise living standards. Rep. DeLauro has led efforts in Congress to achieve full pay equity for women and to ensure that all employees have access to paid sick days. Soon after earning degrees from Marymount College and Columbia University, she followed her parents’ footsteps into public service, serving as the first Executive Director of EMILY’S List, a national organization dedicated to increasing the number of women in elected office, Executive Director of Countdown ’87, the national campaign that successfully stopped U.S. military aid to the Nicaraguan Contras, and as Chief of Staff to U.S. Senator Christopher Dodd. In 1990, Rep. DeLauro was elected to the House of Representatives, and she has served as the Congresswoman from Connecticut’s 3rd District since. She is married to Stanley Greenberg, President of Greenberg Quinlan Rosner, a public issues research firm. Their children—Anna, Kathryn and Jonathan Greenberg—all are grown and pursuing careers. They have four grandchildren, Rigby, Teo, Sadie, and Jasper. My family always stressed the value of public service. Both of my parents served on the New Haven Board of Aldermen and my mother is the longest serving Alderman—or Alderwoman!—in New Haven’s history. They really imparted to me the importance of giving back to your community and trying to better the world around you. I have attempted to live up to the example they set throughout my life. For a long time I worked in more of a behind-the-scenes role… Eventually, I decided that I wanted to hold elected office myself and have been privileged to serve in Congress ever since. A few things stick out. One is doubling the funding for the National Institutes of Health between 1998 and 2003. As an ovarian cancer survivor, one of my explicit goals when I came to Congress was supporting medical research and the fight against cancer. That doubling has reaped real dividends and we have made amazing progress, but we really need to do it again! Another was passing the Affordable Care Act in 2010. Because of that law women’s health care is finally on the same footing as men’s and millions of women will no longer have to pay more for their insurance just because they are a woman. It is truly transformative and people across the country will continue to see more of its benefits in the coming years. While serving as Senator Dodd’s Chief of Staff I was diagnosed with ovarian cancer. I was supposed to be running his reelection campaign and worried about what would happen. When I told Senator Dodd, he was so supportive and told me to take all the time I needed to get better. I will never forget that and it has been a huge part of why I am so driven to ensure all Americans can take time off, without having to fear for their paycheck, when they or a loved one are sick. Clearly we have made great strides. Women make up about half of the workforce and we see more women in leadership roles in both the public and private sector—though still far too few! But women still make just 77 cents for every dollar a man does and make up the majority of minimum-wage workers. This mirrors the growing gap between the wealthiest and poorest in our society. Electing more people to public office who will fight for equal pay, family-friendly workplace policies and better educational opportunities is crucial to righting this. I have introduced the Paycheck Fairness Act in each of the past eight congresses and I will continue fighting for it until we truly have equal pay for equal work. The bill is very simple—it says same job, same pay, regardless of gender. Nearly 50 years after President Kennedy signed the Equal Pay Act into law we should not still be having these same battles. And as I mentioned earlier, we need policies that will make our workplaces more family-friendly and reflect a society where both men and women work outside the home. I have repeatedly introduced legislation to ensure workers can take paid leave when they or a loved one are sick. We have seen similar policies passed in cities across the country and I am hopeful it is only a matter of time before people nationwide have that right. What are your goals for women in the United States and across the globe? Women should be recognized for their skills, talents, and intelligence on an equal playing field as men. Girls should have access to education and be encouraged to thrive in those environments. Young women should be paid the same as their male colleagues and have the same opportunities to blaze whatever career path they choose. And older women should have a dignified retirement and not have to make the terrible choice between food, housing, medicine, or other necessities. At times it may seem like a struggle, but I know that one day all of these goals will be reality. Congresswoman Rosa DeLauro spoke about “An Economic Agenda for Women’s Equality” at IWPR’s 25th anniversary event on May 22, 2013, at the AFL-CIO in Washington, DC. Watch the full video of the event.